August is National Peach Month; and local chefs are celebrating by adding peach to new dishes! As a peach-lover, I’m on board. Today, I’m sharing this recipe so you can enjoy it at home. 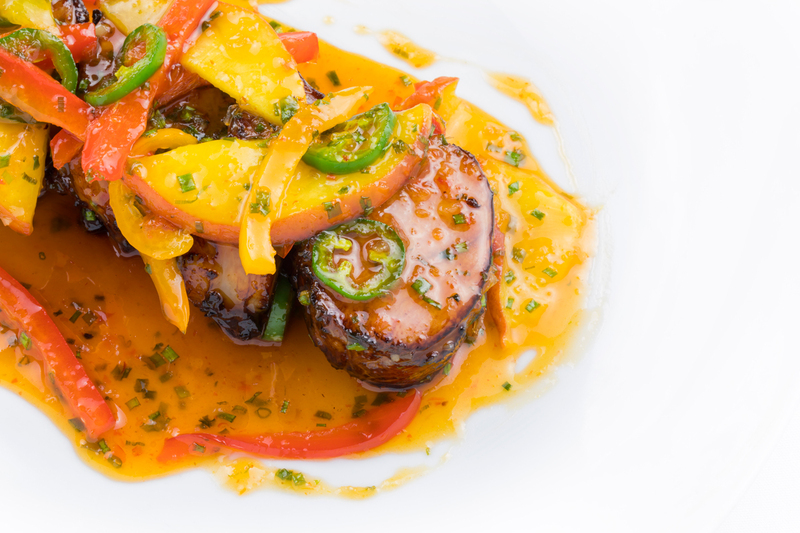 Chef Adrianne has chosen to feature peach flavors by introducing her Chili & Summer Peach Pork Tenderloin dish! This meal has a little bit of everything. The sweetness of the peach, the savoriness of the tenderloin, and the spiciness of the bell peppers will be sure to fulfill your quest for flavor. What’s more, this is not an over-complicated dish, making it a great option to satisfy your guests this summer. Here’s a quick, easy, and outrageously delicious recipe honoring the peach. In a large bowl, whisk soy sauce, mustard, garlic, cilantro, honey, and sesame oil to make a marinade. Add pork, cover, and refrigerate for 3-4 hours. Remove pork from marinade and place on a cookie sheet. In a large skillet over medium high heat, add canola oil, peach, peppers, chili’s, and sweet chili sauce. When it comes to a simmer add the pork and cook for an additional 4-5 minutes.